A pencil's just a pencil, right? No! There's more to pencils than might first meet the eye. Learning about different types of pencils to use in your projects will help you find the best project for your purpose. In addition to using pencils to color your projects, you may also use a pencil as part of your design process. It may be tempting to grab hold of any old pencil when you are crafting, however you'll find that certain pencils are better for different tasks. Pencils for Arts and Crafts? So, what type of pencil is best for your arts and crafts toolbox? While you may need a special pencil for a specific project, it is useful to have an all purpose pencil to hand. You can use this for lightly marking paper, making measuring marks etc. For general use an HB or 2B pencil will be ideal. If you are looking for coloring pencils then there are different types to consider. Watercolor pencils are ideal for adding color to rubber stamped images, as are traditional coloring pencils. Pencils are manufactured in different hardnesses. The term 'hardness' was originally coined as this referred to the pressure that needed to be put on a pencil in order for it to make a mark on paper. Harder pencils needed a harder pressure than soft pencils. Pencil leads are made from a mixture of graphite and clay. The proportion of the graphite to clay determines the hardness of the pencil lead. A hard pencil is less likely to smudge and is better for giving a very sharp line. Soft pencils are used by artists. They are ideal for shading. Being soft, the pencil can be used to leave a mark on a piece of paper without leaving an indentation. Soft pencils - 2B and upwards (the greater the number the softer the pencil - a 4B is softer than a 2B), can be useful in many rubber stamping projects. 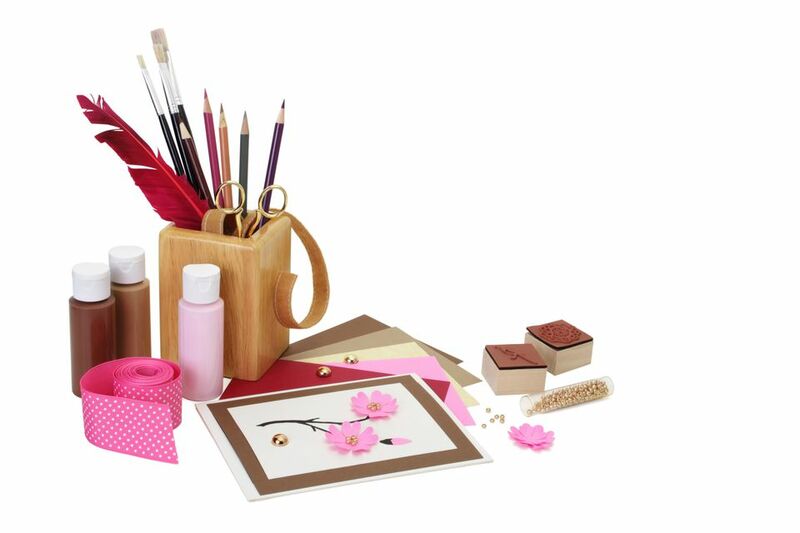 Use a soft pencil when measuring cards or placing stamped images. A soft pencil is also ideal for adding shading to an image. A soft pencil is also useful for transferring images for stamp carving projects. Soft pencils are widely available from art and craft supply stores. They can be purchased as individual items or as part of a set. Sets of different grade pencils are useful, and these can be a great way to buy a range of different pencils for a good price. Pencil sets generally include one or more of the most popular pencil types. Good deals can be found online for pencils. Remember to shop around and compare prices. As well as artist quality pencils, you can also find pencils sets which have been designed for students and these can be great value for money. Whichever type of pencil you choose, you'll find that a couple of pencils are an important part of your crafting tool box.